Gold Victoria Jubilee Sovereigns were minted from 1887 until 1893 and they're an excellent choice for collectors who are interested in the history and heritage of the United Kingdom. Plus, since each coin contains 7.32 g of .916.7 pure gold, they’re a sound investment. The Royal Mint's flagship gold coin attained its international prestige during the reign of Queen Victoria. As Britain's second-longest serving monarch after Queen Elizabeth II, Victoria embodied the tenacity and innovation of a nation. During her 64-year reign from 1837 to 1901, Queen Victoria saw the UK expand its overseas colonies and trade routes. The Industrial Revolution coupled with cultural and civic growth heralded an era of prosperity and enlightenment, and the Gold Sovereign was one of the world's most recognisable coins. Gold Victoria sovereigns struck from 1887 to 1893 are often simply referred to as Jubilee Head sovereigns. These elegant coins were first issued for the occasion of Queen Victoria's Golden Jubilee on 20 June 1887 and they replaced the 'Young Head' sovereigns that had prevailed for the past fifty years. In 1887, the Queen was a 68-year old widow and artist Sir Joseph Edgar Boehm's portrait for the Queen Victoria Jubilee Gold sovereigns released from then until 1893 show her facing to the left and wearing a small crown. The coin's reverse features a departure from the familiar St George and the dragon, with a crowned shield of the Royal Arms by Jean Baptiste Merlen. The Sovereign is the flagship coin of the Royal Mint to this day and historical gold coins are valued for their classic design details and links to the past. Gold Victoria Jubilee Head sovereigns are both sought after and affordable. 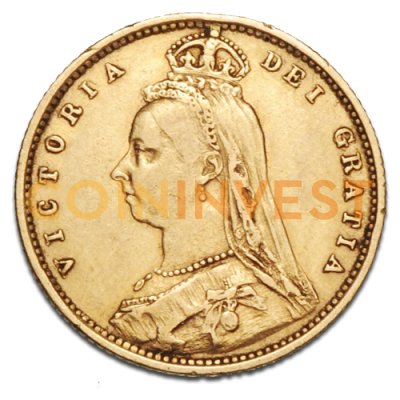 Buy the Victoria Jubilee Gold Sovereign (1887 -93) and add an iconic British coin to your collection with coininvest.com. We always stock a wide range of gold sovereigns and an extensive selection of historical and commemorative gold and silver coins at today's most attractive prices.